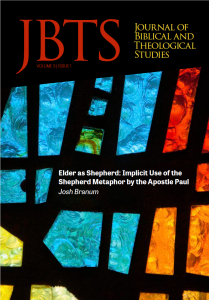 Josh Branum (PhD in Applied Theology, Southeastern Baptist Theological Seminary) serves as the Family Pastor at Faithbridge Church in Jacksonville, FL. this metaphor, he only explicitly uses the shepherd metaphor on two occasions. This seeming omission has led some to dismiss it as a central aspect of his teaching. However, Paul demonstrates a heavy reliance on the shepherd metaphor implicitly, particularly in the qualifications for eldership in the books of 1 Timothy and Titus.